Real Country Sausage is a family business born from a family business. The sausage business may only be a few years old, but Dockery Branch Farms goes back for generations. RCS is committed to producing traditional farm-fresh country sausage and hand-tied link sausage, plus nitrate-free brown-sugar-cured bacon. These guys are doing it the way it was meant to be done. 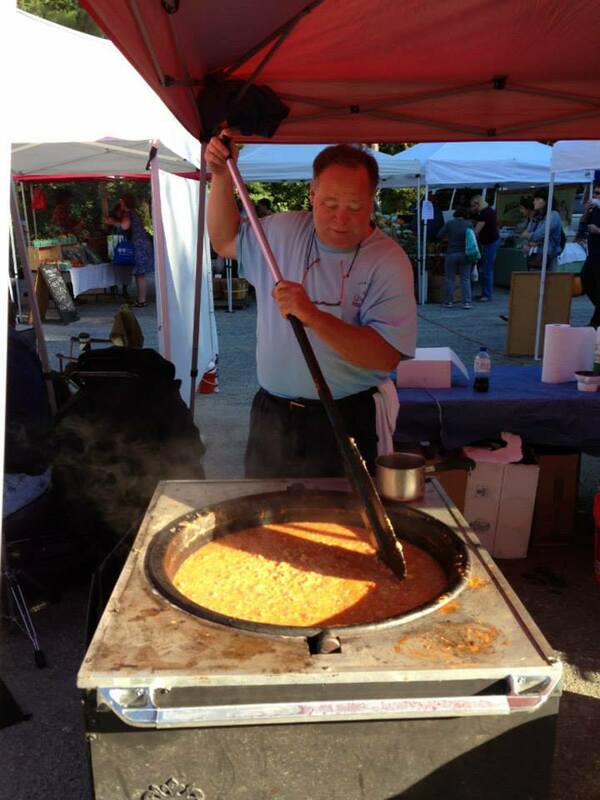 Recently, RCS has started offering Brunswick Stew fresh at the farmer’s market. Stew-lovers can get their fill at the market AND take a pint..or a quart..back home for later. Like, Share, or Comment on this post on the GrowRVA Facebook Page, and you’ll be entered to win a quart of Brunswick Stew from the South of the James Market. We’ll announce the winner at 8pm on Friday. What is the name of your business, and what do you sell? The name of my business is Real Country Sausage and we sell fresh, homemade sausage products. Products include Country Sausage, Brats, Italian, Polish, Andouille, and Chorizo. Other products that are seasonal is salt cured hams, and sugar cured bacon. What’s your most popular item, and why do you think it’s such a hit? Country Sausage is the favorite. It often reminds people of something from their childhood. Most everyone that comes through the market is looking for something fresh and from the farm. It is something they can eat or use that reminds them of their parents or grandparents. In our case country sausage was made in the winter with the fresh hog meat and obviously seasoned without fillers and preservatives. Good country sausage can not be bought in the commercialized sausage sections in the grocery store. How long have you been in business? What is something that would surprise people about what you do? I started my business in 2011. After graduating from Virginia Tech in 2008 I worked for New York Life and realized my heart was on the farm. I took my Agricultural Economics degree and put it to work. I came up with an idea to bring Real Country products to town. What other market vendors do you trade with or buy from? I always like to trade. That is the best part is bringing home new products to try through the week.. Then the new products turn into weekly products and then the grocery store just took the back seat on many goods. The vendors I like to trade with is Walnut Hill Farms, Reginalds Peanut Butter, Barham Seafood, Flower Child, Yoders Donuts, Simply Southern Pies, Pickled Silly, Kens Limemade, and Saunders Brothers. Wake up is around 3 am. We meet at the Sausage House at 4 to start packing the trucks for all the markets. When we are packed with meat and supplies we head north to set up my first market in Brandermill. After we get Bob set up with his tent, tables, grill, and meat, I head over to the Park. Hoping to have the grill hot by 7 we have country sausage sandwiches to fix and samples to grill. When the gates open at 8 am its all you want until 12. A fun crowd and watching other great vendors market their goods makes this Saturday process never get old. Clean up by 1 pm and then go clean up Brandermill. Usually we get home by 5 and unpack. I love their products. Good people too, even though they are VA Tech people. Next Next post: Help SOJ Stay in the Park!